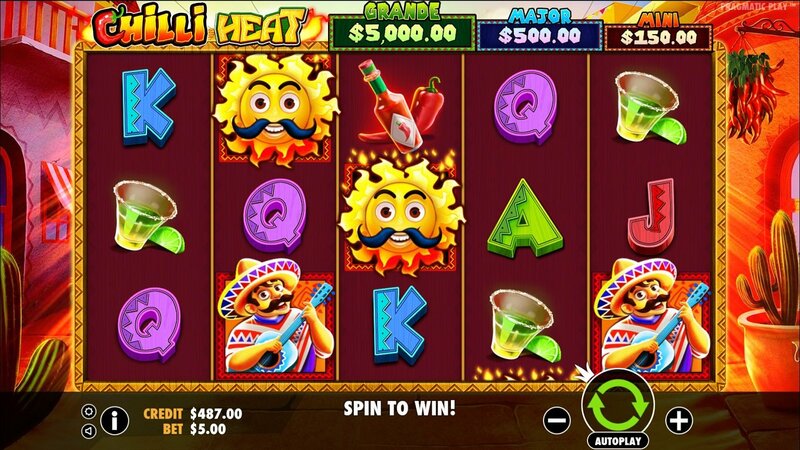 Chilli Heat slots online is one of Pragmatic Play’s latest creations and its Mexican theme makes for a dynamic game. The joyous Mexican music and flaming reels set you up for a great adventure into the Mexican way of life. This slot has a 5x3 board setup and has a maximum of 25 pay lines on offer to the players. The Chilli Heat slot has more than enough to keep your interest and provide a variety of ways in which you can win. If the base game isn’t doing the job, the Money Re-Spin Feature and Free Spins Feature will keep you happy. Try our mobile casino deposit and start spinning today! You can play slots by Pragmatic Play. When you begin to play this slot, you’ll be greeted by upbeat Mexican music and the set of a vibrant street with a party atmosphere. This immediately sets the tone for the aesthetically pleasing game play and dynamic bonus features. * MONEY RESPIN FEATURE – The Money Re-Spin FEATURE is triggered when you hit 6 or more money piñatas symbols. You’ll then be taken to a new set of reels where you’ll be awarded 3 re-spins and for each re-spin the current symbols will be locked as you try to fill the blanks with more money sacks. If you fill a blank space with a new money sack, that will be locked in and your re-spins will be reset to 3. This process will continue until you fill the screen and hit the jackpot or you run out of spins. * FREE SPINS FEATURE – Hitting 3 flaming sun SCATTERS will trigger the Free Spins FEATURE. You can only hit these scatters on reels 2, 3 and 4 and they will award you with 8 free spins. The lower value symbols will be removed for the Free Spins FEATURE. More casino promos for you! Chilli Heat is a perfect example of why Pragmatic Play have a reputation for creating quirky bonus features. The well-designed bonuses within this slot take this game to a completely different level that wouldn’t be possible without creative developers. The Mexican theme is undoubtedly a pleasant change from your run of the mill slot and gives players an insight into that specific culture. Pragmatic Play have definitely got a great slot on their hands which you should try out as soon as you get the chance. 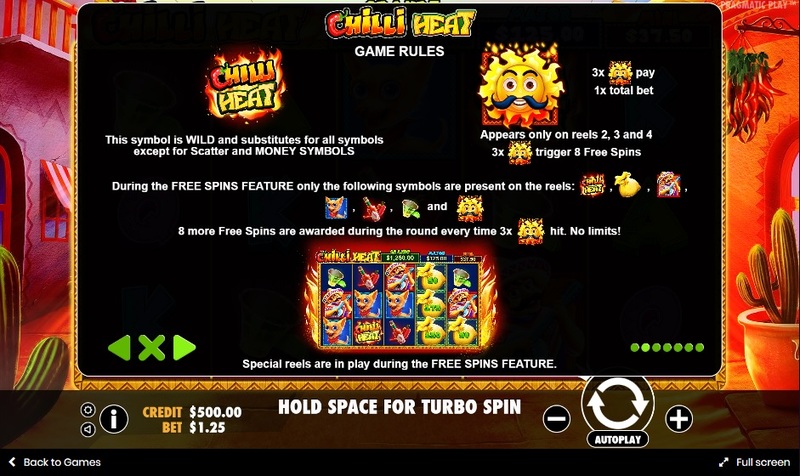 If you enjoyed Chilli Heat why not try another online Easy slot game.